The words ‘sales’ and ‘sales room’ immediately bring a picture in our minds…that some veteran guys are conspiring in a closed room bringing out innovative ideas to make their selling-graph grow northwards. That is the one and only goal of their lives. Precisely, the world moves on this idea of selling and if you think deeply, we are all ‘sellers’ and simultaneously ‘buyers’. You don’t agree? Okay, we’ll discuss this issue in some other post 😀 Leaving aside this intense psychological debate, let me come to the point. I recently read R.T. Manu Ramesh’s debutante work,“The Sales Room” and this book is the source of my above soliloquy on sales. The story opens up as we find the protagonist, Rajesh Iyer, returns to his previous organisation, Oregon Software Technologies, after a futile attempt to get admitted in a business school in the US. But things there are not same anymore. There has been a drastic change in the company, from a successful face-lift of the office building to the ambiance inside and even the behaviour and temperament of his colleagues. He finds himself in a position which is much lower than his previous designation. The boss, Venky, is a typical one and is insouciant about anything but sales and target. Rajesh tries his best to cope up with the situation and the narrative smoothly goes on as we enjoy a merry-go-round journey of the pros and cons of the sales department and selling as such. The book portrays a clear picture of the life of a salesperson. An introspection of their busy minds. That they always have to remember that the only difference between ‘try’ and ‘triumph’ is just a little ‘umph’! How they have to mobilize their personal resources and connections to achieve a deal and no matter what happens, the sales-chart must rise! 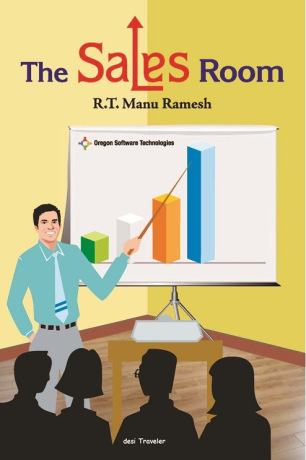 “The Sales Room” is an out of the box approach to deal with the strategies and workings of a start-up and I think most male readers (in some cases females too) can relate to Rajesh’s story easily. You’re sure to enjoy this book if you’ve a sales background or related to ‘sales room’ in some way or another. RT Manu Ramesh has graduated as a Mechanical Engineer from the reputed RV College of Engineering, Bangalore, India, in 2006 and started his career in the IT industry as a software programmer. He however found his true calling a couple of years later when a dynamic, young, entrepreneur, invited him to join his start-up, Aurigo Software Technologies, as a part of the Sales and Marketing team. The firm was to expand in India in a big way. Playing a crucial role in the company’s growth Manu was instrumental in its foray into the India market and acquisition of first ten customers in India. He now works for an MNC and is based in San Jose, California. He is an avid tennis player and swimmer. He has an ear for music. He enjoys travelling, reading, surfing and watching movies during free time. Good review, but I find the title of the book too boring. Hi Indrani, Some folks have asked me about the title, the reason for it is that the entire plot unwinds the room where the sales people sit down and hence the title ‘The Sales Room’. The book looks interesting. I might pick it up. Nice review.